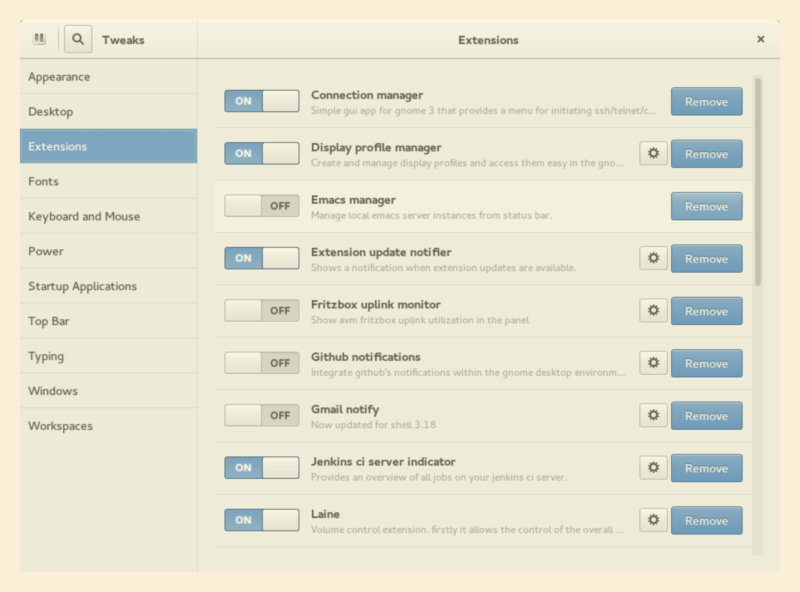 Gnome Shell 3.18.5 notified me some extensions needed updating. I went to: https://extensions.gnome.org/local/ in FireFox, updated the FF extension, and now I want to uninstall some of the Gnome extensions. E.g. System extension should be uninstalled using package manager. See about page for details. What is «System extension»? How to uninstall it? System extension is installed to system-wide location (usually «/usr/share/gnome-shell/extensions»). Such extension may be used by any PC user, however it can be uninstalled only by system administrator (root). To uninstall system extension use your distro's package manager or ask your system administrator. I looked through Synaptic but don't see this extension. How do I remove it? Select the extension and click on "Remove"
Since the remove buttons are no longer available in gnome-shell 3.26, the only way I know is deleting the extension directory itself. Open Nautilus and show hidden files (press CTRL + H). Go to your home folder. Delete the directory of the unwanted extension. Finally, reload gnome-shell. Press ALT + F2, type r and press ENTER. Go to software -> add-on, you will see your extensions there, just remove them. I had the same problem with the same extensions. The problem is that they are "System Extensions" and not in the normal location of ~/.local/share/gnome-shell/extensions as others have said. Instead, "System Extensions" are installed in /usr/share/gnome-shell/extensions. Head to https://extensions.gnome.org/local. Install the Chrome / Firefox native connector for GNOME Extensions, and then you will see your GNOME extensions listed on that page. From there you can remove them and configure them without deleting files manually. Not the answer you're looking for? Browse other questions tagged gnome gnome3 gnome-shell or ask your own question. How do I install user theme extension in Gnome in Fedora 16? How are Gnome shell extensions supposed to be managed? How to get rid of GNOME Shell Integration extension in Chromium on Debian? How can I install GNOME shell extensions from extensions.gnome.org through Firefox on NixOS?